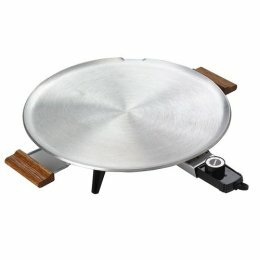 Large size - 16" Round Grill with Recipes enclosed. This Bethany Heritage Grill has an overflow spout on rim to control splatter and spills. Includes #800 Grill Probe control with 3' long cord for convenient countertop use with tempurature controled dial from warming to 500 degrees. Uses: -Norwegian lefse -Flatbreads -Tortillas -Injera -Bacon eggs -Pancakes -French Toast -Smoked Fish -Pizza Hamburgers -Grilled Cheese -Steaks.